If you put one person completely in charge of a seven-part crime thriller you'd probably send that person mad. But if that person was Hugo Blick - famous for low-key but popular BBC Two comedy like Marion & Geoff and Sensitive Skin - it wouldn't matter. Because Hugo Blick is probably quite mad already. And watching The Shadow Line, which Blick has written, produced and directed - and maybe even organised the catering, we don't know - you can well believe he's lost it. Because it is bloody terrifying. To describe the plot using words - you know, these things here - won't do it justice because it's so multi-layered and complex and that, but it's basically the police and drug gangsters all trying to find out the truth behind the murder of drug baron Harvey Wratten immediately after his prison release. No one is safe, and especially not at the hands of a sinister character called Gatehouse, which is Stephen Rea in a mac and a hat and a nice line in top-secret lairs equipped with lots of technology and a microwave, in case he fancies heating up a pasty. But somehow, Gatehouse gets people to trust him before either killing them, or putting their lives in danger so that they obey his wishes. It is definitely tv for grown ups - noirish, film-like, patient, tense, murderous and, as Blick says himself, with a "grim humour". It's also very confident - episode five begins with what is pretty much a 15 minute two hander between two characters we haven't met before - although we know one of them, and we know to fear him. 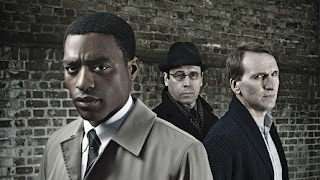 While later in the same episode Christopher Eccleston's character goes to bed with the posh English lady from Nurse Jackie (Eve Best), while drug dealer Bob Harris (Robert Pugh) is killed changing a car tyre, in a hit organised by his ambitious rent boy lover, while chief cop and amnesiac Jonah Gabriel (Chiwetel Ejiofor) finds his boss isn't all he seems either. Blick tells The Guardian he spent four months in a room plotting the numerous and overlapping plot-strands for the programme. He said: "I bought a white board, three feet by four, and created a double helix of the entire conspiracy, working backwards with the murder at the bottom." You can well imagine. Putting one man in charge of everything could have been a disaster, but The Shadow Line is probably the most gripping thing to hit tv this year - and if a well spoken man in a hat knocks on your door DON'T BLOODY LET HIM IN WILL YOU. Best drama I've seen in years. Hugo Blick really has stepped out of the shadows with his brilliant script, masterfully performed by the whole cast. A special mention for Stephen Rea, who has been utterly mesmeric. Amazing series, please repeat on BBC 1 Auntie Beeb! Although I much prefer BBC 2 I haven't found a single other person who saw The Shadow Line and this series deserves to be seen. How about another series about Counterpoint? Evil though he is, he's kind of loveable too! First rate story, well acted, that did capture the quality of the best BBC dramas of the 80s. Not too surprising that viewing ratings fell - the X-factor audience will struggle with something of this quality. Less is more. Shut up and listen and watch carefully otherwise you'll miss one of the many threads. Gatehouse is George Smiley on crack. Excellent, intelligent, absorbing series, well filmed and acted. Like Bede's temple, Thursday nights now have a hole in it. Still not completely gripped the storyline 100% but I guess its like buying a Ferrari, sometimes you admire the sheer beauty without needing to understand the engine management system. Thanks for all your great comments everyone - hopefully Hugo Blick will do something else in this vein again soon, and hopefully with more Gatehouse! Hopefully Hugo Blick won't do something else in this vein soon. Like roadkill just a pointless waste. And if he does I'll at least know not to start the journey......... err! I mean ordeal. best thing on tv in years. i cant get enough of it! just about to watch ep 7 on iplayer... yipeeeeeee! I haven`t watched the last episode yet, I want to savour it. Please let Gatehouse die painfully. He is evil. I`ve loved The Shadow Line but have felt for those killed who such as the driver of Wrattan`s car & his wife, Jonah Gabriel`s son. One thing I didn`t understand was why Gatehouse didn`t kill Glickman when he found him in Ireland? Perhaps the answer is in Episode 7. I found it quite gripping, wanting to see who was going to get to the killer first, the police or the criminals. It doesn't surprise me that Hugo Blick wrote it backwards, it's the only way to keep track. More like it please Auntie. Simply loved this series, probably the best thing shown on tv this year.. Intelligent and clever and totally obsorbing... I loved it pure amd simple.. BBC at its best!